Shadows of Esteren 0-Prologue provided us with an introduction to the French RPG, Les Ombres d'Esteren or Shadows of Esteren, published by Agate RPG. In its few pages we first learned about the setting of this low, dark fantasy RPG—the Tri-Kazel peninsula, populated by the descendants of the same tribes that have long since coalesced into three countries and begun to follow their own paths. Tol-Kaer adheres to the old tribal ways and the Demorthèn spiritual cults; missionaries from the Great Theocracy from the rest of the continent to the north have converted Gwidre to the Temple of the One God and adopted feudalism; whilst Reizh, fascinated by the machines and ‘toys’ of the Confederation, has taken up the science of Magience, developing and creating devices powered by ‘Flux’, an energy derived from matter itself, though not without its cost to the environment and land itself. Although the peoples of this an isolated and hilly, heavily-forested spit of land are divided by nation and by ideologies and traditions, what binds them together is a fear of the Feondas, an enemy that the Demorthèn consider to be the expression of death and destruction unleashed by chaotic nature spirits; the Temple see as demons; and the Magientists regard as a natural predators to be neutralised. The exact nature of Feondas remains undetermined, but all fear their predations and what their corrupting influence might turn human nature to… It is this, combined with the facts that the rules for Shadows of Esteren do not quantify or necessarily stats for the Feondas, that the rules include a solid Sanity mechanic, and that the rules possess a certain brutalism have led some to describe the RPG as at least being Lovecraftian, if not actually Cthulhu Dark Ages done right. In addition to introducing the setting of Esteren and the Tri-Kazel peninsula in particular, Shadows of Esteren 0-Prologue also provided the Game Leader and his players with everything necessary to start playing Shadows of Esteren. That included an explanation of the RPG’s mechanics as well as a sextet of pre-generated player characters and ‘Omens’, three complete, ready-to-play adventures. The trilogy is essentially the prologue to the game’s overarching campaign as well as an introduction to its themes of tradition versus progress, of fear of the unknown, and having to come to face to face with your own fears and faults. What Shadows of Esteren 0-Prologue did not include was an expanded exploration of the setting, rules for character creation, rules for any of the setting’s magics and sciences, or indeed, an explanation of what exactly the Feondas are. Indeed, we will still have to wait for the latter, for there is no such explanation in the next book in the line, Shadows of Esteren 1-Universe. It does though, give hints as to what they may be and it does include the rest—an expanded exploration of the setting, rules for character creation, rules for the setting’s magics and sciences—plus advice on running and playing Shadows of Esteren. Shadows of Esteren 1-Universe introduces us fully to the setting of Esteren, devoting almost two thirds of its content to this description over the course of three chapters. These cover the Tri-Kazel peninsula—its geography, history, peoples and their attitudes, its would-be capital city, Osta-Baille, the three nations that dominate it, Gwidre, Reizh, and Taol-Kaer; the lifestyles of its peoples—habits and customs, crafts and foods, architecture, societies, mercantile practices, and its arts; and its factions—the Demorthèn, the Temple, the Magientists, the Varigals, and the Hilderin Knights. The last of these three chapters is rounded out with a page or two of rumours. All of this information is presented in a series of letters, journals, and reports, as well as sections of fiction, and is full of detail and colour. For example, on Tri-Kazel’s south-east coast, the beaches are flat and wide enough that it is common enough to travel their length by sail wagon; that the Bent Tree, an inn in Reizh built inside the trunk of a slumped, giant sequoia tree, serves alcohol sparsely lest its clientele suffer a terrible fall over its raised floors; and that the tenets of the Temple revere austerity to the extent that its worshippers value snow and the cold as signs of purity! For players and their characters, the sections on the factions of Tri-Kazel will be of particular interest as they provide patrons, enemies, rivals, and inspiration. The Demorthèn, the Temple, and the Magientists receive the most pages each, while the Varigals and the Hilderin Knights receive fewer. Of these, the Demorthèn embrace nature and value balance, learning and guarding the secrets of the deep woods of the peninsula, and are capable of mastering the ancestral art of Sigil Rann and thus command the powers of nature through the Ogham Stones—Air, Water, Vegetal, Life, Animal, Fire, and Earth. Together with the Varigals, travellers and messengers who spread news and stories via the secret ways each apprentice learns, the Demorthèn impart much of Shadows of Esteren’s Celtic feel. The Temple worships and proselytizes the One, organised into six orders, adhering to six ordinances and six daily prayers, and worshiping in and building hexagonal buildings. Through prayer and chanting, the devout of the Temple may learn to invoke miracles that can castigate, protect, bring down divine wrath, induce faith with stanzas, and even miraculously heal. Magientists build and operate devices and artefacts, searching for and extracting Flux from mineral, flora, and fauna. This takes time and effort, but they think it worth it in the name of progress. Lastly, the Hilderin Knights is an independent order dedicated to destroying Feondas. They and the Temple invoke parallels of the Crusades, just as the Magientists lend the setting the feel of the Age of Enlightenment, although one with a steampunk-like sensibility. Like Shadows of Esteren 0-Prologue, six pre-generated characters are given in Shadows of Esteren 1-Universe. The six, which include a male Varigal, a male warrior, a female Demorthèn, a male Theologian of the Temple, a male Magientist, and a female Bard, are different to those given in Shadows of Esteren 0-Prologue. They are written as a group and are included as samples, as inspiration, and as ready-to-play characters. Indeed, it would be possible to play through the ‘Omens’ trilogy from Shadows of Esteren 0-Prologue using these characters, or those created using the rules in Shadows of Esteren 1-Universe. Character generation in Shadows of Esteren involves selecting the character’s ethnicity, profession, birthplace, and social class before assigning to various factors. First to the core traits of a character’s personality or the five Ways—the Way of Combativeness, the Way of Creativity, the Way of Empathy, the Way of Reason, and the Way of Conviction. They are not attributes as such, but ‘ways’ of thinking and acting to which ratings of one, two, three, four, and five are assigned. Each Way possesses Qualities and Flaws—positive and negative Traits, so for example, possible Qualities and Flaws for the Way of Combativeness include assertive, optimistic, brash, and stubborn if high a high value, but calm, level-headed, pessimistic, and sad if a low value. A character needs to choose two Traits—one Quality, one Flaw—attached to his Ways. Choice of Profession grants a character a primary Domain and a secondary Domain. Each represents a broad skill, such as Craft, Close Combat, Erudition, Magience, Prayer, or Science, and is valued between 1 and 5. For example, the primary Domain for a Knight is Close Combat, the secondary Domain either Relation or Travel. Beyond a Domain value of five, a character must specialise in one or more Disciplines, each of which is valued between six and fifteen. Thus a character might have a Domain of Close Combat 5 and a Discipline of Axe 9, meaning that his rating with a knife would be 5 and 14 with his Axe. A character also receives levels in other Domains, these based on other pursuits as well as birthplace and social class. All characters start between the ages of sixteen and twenty, but can be older. This grants them bonus Domain levels, but will also give them Setbacks, randomly rolled events that have a negative effect on the character. Every character receives one hundred Experience Points to further develop his Ways, Domains, and Disciplines. He can also select Advantages and Disadvantages, though there are relatively few of these in the game. There is also a wide range of derived statistics to work out before play begins. Our sample character is Alane, the younger son of a wealthy Reizh merchant who was enrolled at university to study Magience. Traumatised as a child by the fire that killed his mother, Alane grew from an introverted and bookish boy to a studious man who relished every chance to learn and works hard to be personable. His father wanted Alane to enter the family business, but his tutor persuaded his father of his son’s scholastic brilliance and suggested that he take the examinations to enter university. These he passed with ease and for the next few years he engrossed himself in his studies, progressing at a prodigious rate, often finding himself distracted because he was outpacing his fellow students. Becoming bored he began to read other books and scrolls on a variety of other subjects—this eventually would be his downfall. Since he found the study of Magience relatively unchallenging and he found other subjects to fill his time and intellect. Thus he discovered Occultism and became obsessed with it to the point that although he passed his final examinations, it was not with the distinctions expected of him. Without these, Alane found himself posted to more mundane tasks that he found unchallenging and eventually boring until he drifted off into studying Occultism. The Council of Baldh-Ruoch has no idea where to send him and so he went back to his family, but there he found no welcome. Instead, he was thrown out, his father refusing to fund his studies further. Currently Alane tries to find work in the university libraries, but this is not quite enough to support him or the life of reading and study that he wants. He has begun doing small tasks and helping others find things, answer their questions, and solve their problems. This brings himself some funds and on occasion he can be challenged. Alane is a sparse looking youth, slightly unkempt, with a penetrating look. His clothes have been patched again and again, but he tries his best, if only for his mother’s sake. He will undertake many tasks, each one being given his undivided attention. Physically he is less capable, even cowardly, and barely knows how to handle the dagger he carries in his belt. Ways: Combativeness: 1. Creativity: 4. Empathy: 3. Reason: 5. Conviction: 2. Skills: Close Combat: 2. Erudition: 4. Magience: 5. Occultism: 3. Perception: 5. Relation: 2. Science: 2. Travel: 1. Sanity: Mental Resistance: 7. Trauma: 0. Combat: Attack: 3 (Dagger Damage: 3), Defense: 13 (Protection: 4). Mechanically, Shadows of Esteren is simple and straightforward. Whenever a character wants to undertake an action, he rolls a ten-sided die and adds it to the total of a Way, a Domain, and a Discipline. Typically, a character will be rolling against a Threshold of 11 (Standard), 14 (Complicated), and 17 (Difficult), with characters not needing to roll if their total is higher than the Threshold. The same mechanic is used throughout Shadows of Esteren—it is simple and it is direct, working well with the combat mechanics that have the potential to be short and brutal, the Sanity system, and Shadows of Esteren’s magics. The Sanity system has the characters making rolls against a Threshold set and kept hidden by the Game Leader as is each character’s mental state in game terms. The mechanics for the Sanity system are perhaps the more complex of those found in Shadows of Esteren 1-Universe, as are those for the Demorthèn Art and the Miracles of the Temple. The systems for both present a similar and flexible means of handling the ‘magics’ of the setting, that start off with quite small effects and build up with an accompanying rise in Threshold difficulties. For example, using a Vegetal Oghamic Stone, a Demorthèn might camouflage himself in the surrounding undergrowth with a Difficult (17) Threshold for a minute, but if he succeeds at a Heroic (30) Threshold, he might even cause plants to bloom, trees to grow, and thickets to spread for miles around. Essentially the mechanic requires to the player and Game Leader to agree upon a Threshold for the desired effect rather than presenting a set of ‘spells’. In contract, the section on Magience is something of a disappointment, primarily because of its limited focus. This is essentially on the extraction and refinement of Flux, the substance that fuels the artefacts and devices built by the Magientists. A list of common devices is included in the book, but there are no rules that allow the player character Magientist to devise and build items of his design. To be fair, there is enough here to get a campaign started involving the Magientists. Advice is given on allowing player characters to start with the Demorthèn Art and the Miracles of the Temple. The advice for players and Game Leader alike is excellent. At the heart of said advice is that they ‘role’ with the system rather than roll it. The good news is that the system is light enough and unobtrusive enough that it supports this advice, though it does very much means that Shadows of Esteren 1-Universe is not a book for anyone new to roleplaying. Elsewhere, the advice covers character creation and play, types of player character group set-ups, and so on. The advice presented here is always straight forward and it is always useful. As with Shadows of Esteren 0-Prologue, the look of Shadows of Esteren 1-Universe is incredibly well done. The artwork is rich and detailed, and adds a great to the look and feel for the setting. The book is also well-written—to an extent. The problem is one of translation, Shadows of Esteren originally having been Les Ombres d'Esteren, so occasionally some oddities in terms of phrasing do slip through. More of a problem is the density of the text and its presentation. With the setting presented through in-game means through letters, reports, and so on, it becomes quite difficult to assimilate it—let alone finding any particular fact or aspect of the setting in the book. This impedes both the imparting of the setting of Esteren to his players by the Game Leader and his making use of it to write material of his own for a game or a campaign. In this it does not help that the book is very much organised to keep its setting material and its mechanics very much apart from each other, so often there is not the immediate correlation between the two. If you have seen Shadows of Esteren 0-Prologue and liked it—and why not when it is available to download for free?—then Shadows of Esteren 1-Universe is your next step. Beautifully presented, it pulls you further into the rich and detailed world of Esteren and the Tri-Kazel peninsula, immersing you with detail after detail. It presents a low fantasy and grim fantasy world with just a hint of horror and the unknown—details of both will have to wait for later books—that offers quite a lot of options in terms of what can be played. 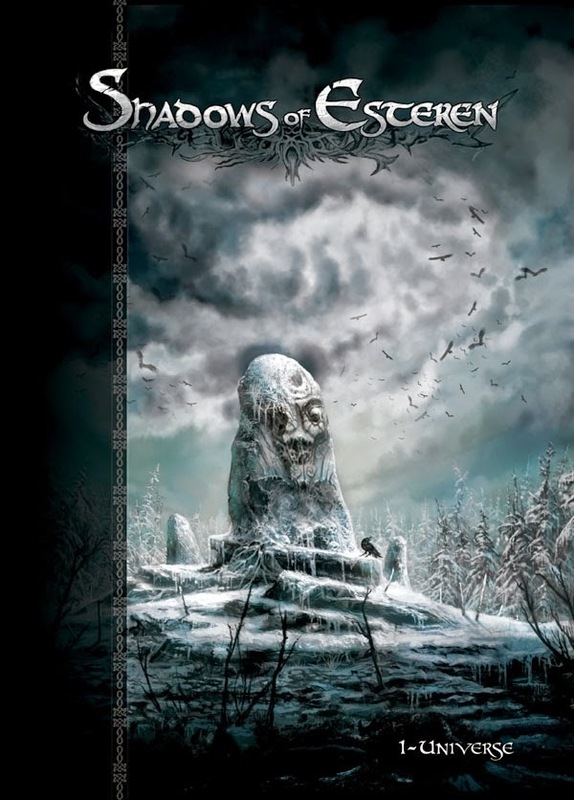 There is still yet plenty of information about the setting that has not yet been given and will have to wait for later books, but Shadows of Esteren 1-Universe is an excellent introduction to its setting and mechanics that do require more attention than most fantasy RPGs.